Metric is built with bands and other musicians in mind, but that also makes it perfect for DJ use. It’s built with an event system, photo gallery system, as well as video system. Metric is responsive which means it’ll look great not only on desktops but also on tablets and smartphones. Muse is made by the same developer/designer as the first theme mentioned on the page, but offers a different look. Muse puts your latest video front and center. This makes it great to showcase your latest EPK video or latest party video. Muse also does a good job of showcasing all of your music oriented social networks. Tuned Ballon is aimed to be more straightforward for beginner users, boasting the least complicated user panel of the bunch. This theme puts your bio, latest blog posts, and upcoming shows front and center so people won’t have to look far on your site for that info. Shaken Encore is a very minimal theme designed by the people at Audiotheme. Audiotheme designs WordPress themes specifically for artists in mind, so it’s super easy to add all of your shows, music, and videos. BeatHeaven is great because it shows off three of your biggest upcoming events right away, followed by a music player with your mixes / tracks in it. Under that is one of the most unique upcoming events displays that we’ve seen for a WordPress DJ site, and may be worth taking a look at for that alone. Banda is a great option for a WordPress DJ theme because it shows your upcoming events front and center, along with recent blog posts and videos. Kontrol is great choice for a WordPress DJ theme because the front page of the site features just about everything you need to display to your fans: upcoming events, latest tracks, and all of your latest blog posts front and center. Hernan is a great option for a WordPress DJ theme because it displays all of your latest photos and videos front and center. This is great if you have tons of videos of your gigs! 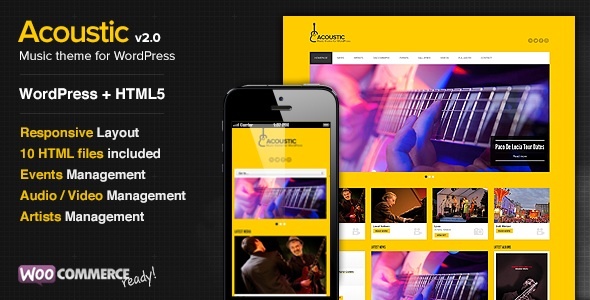 Acoustic is a great theme for DJs that may be new to WordPress as the backend management contains a straightforward way to manage your events, audio files, and image galleries. 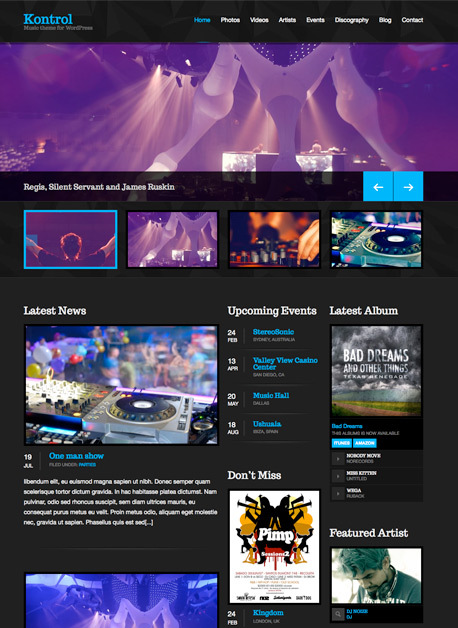 That’s all we have for now for our first round of WordPress DJ themes. Stay tuned for the next round where we feature several free themes that can be edited for DJ use.